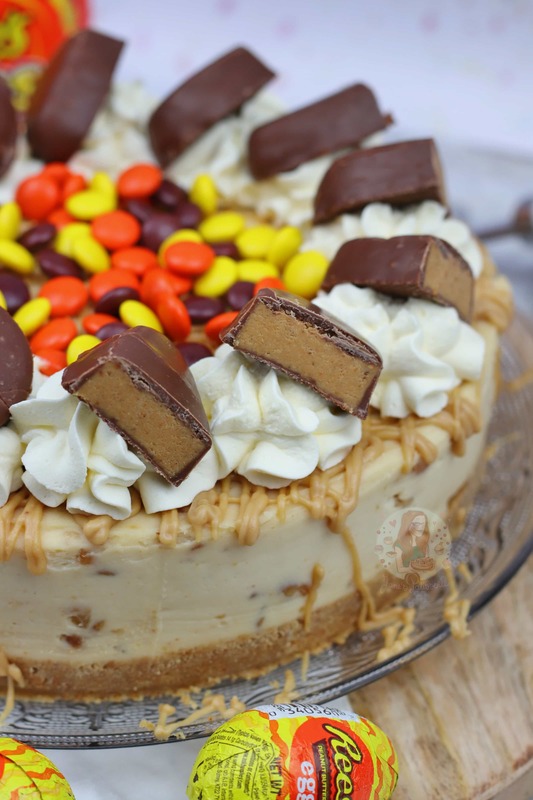 A Delicious, Sweet & Nutty No-Bake Peanut Butter Cheesecake with overload Peanut Butter Decoration! Definitely one for PB lovers out there! OKAY FINE, I WILL GIVE YOU A PB CHEESECAKE. I’m not joking, near enough daily messages about this, so I thought I would oblige. Now, to let you into a secret, I can’t eat peanut butter… (which is why the PB recipes have been lacking so far) so, I personally haven’t taste tested this one, but my trusty taste testers have and they adored it – so I trust them entirely. To make it even more inviting to you guys, I made it a bit of a Peanut Butter overload on the decoration, so I hope you appreciate it! 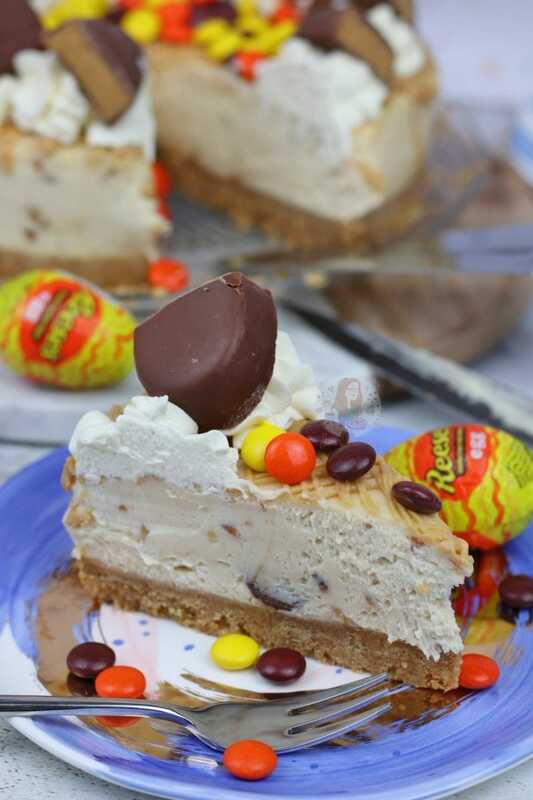 I went along the same lines as my No-Bake Biscoff Cookie Butter Cheesecake and Ferrero Rocher & Nutella No-Bake Cheesecake as it really is a similar idea. All three cheesecakes use a spread of sorts to flavour it, so the idea behind it is the same! Use Cream Cheese, a dab of sugar and vanilla, and the spread of choice – obviously, PB this time! Then add some cream. 450ml of Double Cream creates a smoother and creamier cheesecake, 300ml is slightly smaller and will make the PB stronger – but my taste testers said the 450ml cream one was better! It is quite easy to turn many of my recipes into Peanut Butter recipes if you wanted to try some more – anything that I have used Cookie Butter/Biscoff in would work, simply swap it to peanut butter! 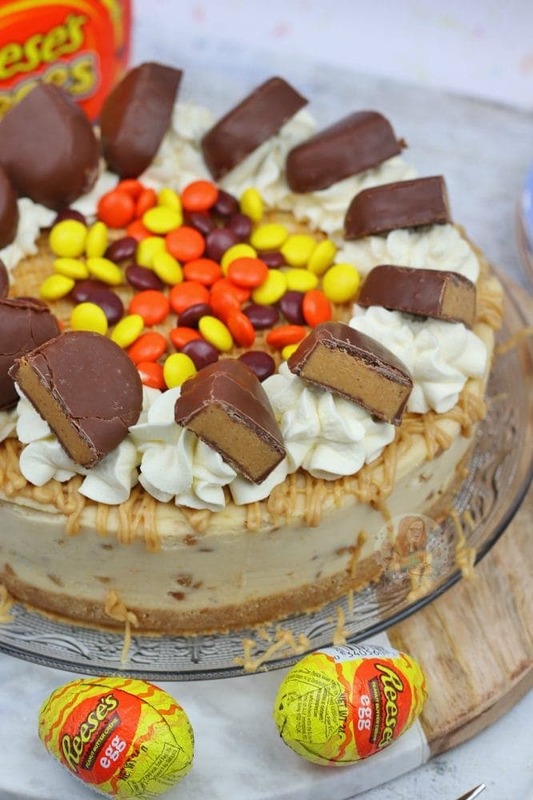 You could have Peanut Butter Cupcakes, Cake, Fudge and more! I really hope that I did will with this one considering I couldn’t eat it, but I hope you guys love it! Enjoy! Blitz both of the biscuits for the base in a food processor until they’re a fine crumb. Mix with the melted butter and press down firmly into an 8″/20cm Deep Springform Tin. Spread the mixture evenly over the biscuit base and chill in the fridge for at least 5-6 hours, but preferably overnight. 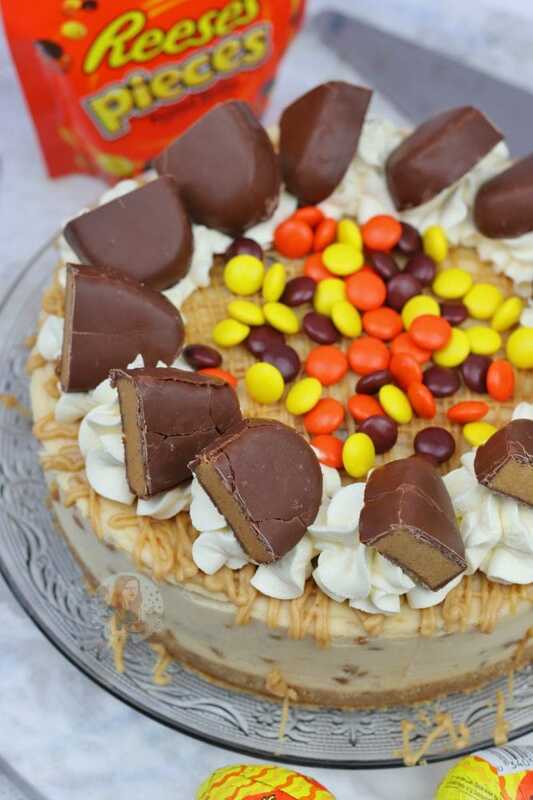 Remove from the tin and decorate – I drizzle on the melted peanut butter (melt the peanut butter in 10 second bursts), then added some whipped cream (whip together the cream and icing sugar), halved Reese’s Peanut Butter Cups, and some Reese’s Pieces! I always recommend using a 8″/20cm Deep Springform Tin in my recipes as they fit the mix perfectly! I serve mine as it is, or with a dollop of clotted cream – so much creaminess. This will last in the fridge, covered, for 3 days. This recipe has been updated - the only difference is the base. The original recipe used 200g Digestives, 100g Oreos, and 125g Butter. Older Next post: Honeycomb Crunchie Cupcakes! Newer Previous post: Rolo Cupcakes! What are digestives that are in your recipe. Is it like graghm cracker crumbs? If you are in America, the closest for you is Graham Crackers. I have only come across your site yesterday while hunting the perfect dessert for my husbands and mine’s romantic meal tonight, (14/2/18) have already made this and it’s been setting since last night, I dont’t know who is more excited to try it! 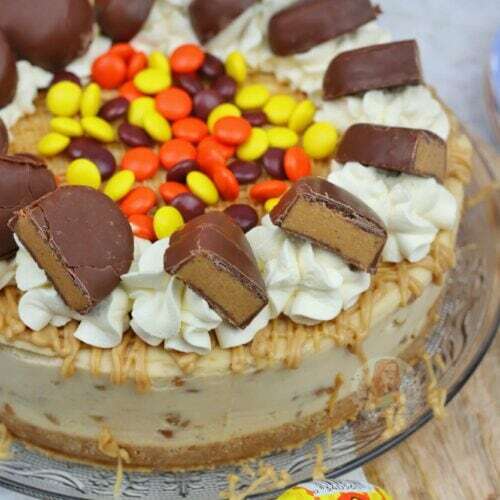 I often make cakes for friends and family and pin them to Pinterest I will do so with this and link your site, thanks for the perfect dessert! Hi. 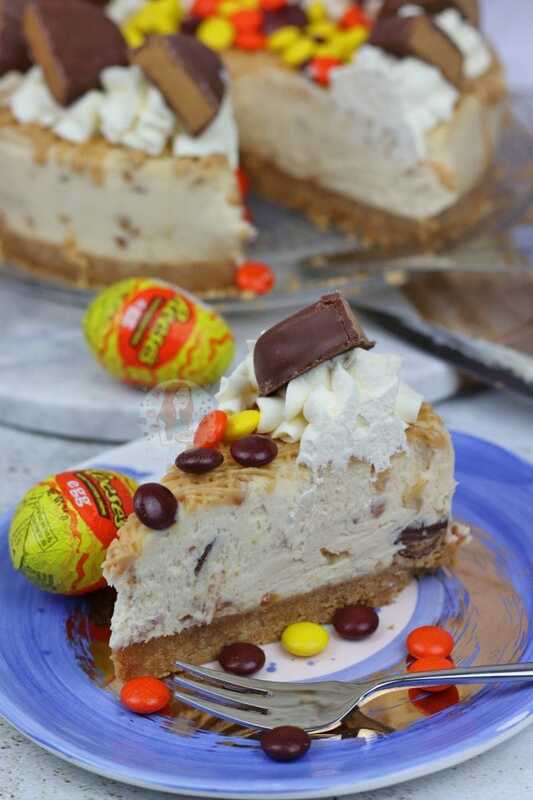 I would like to try your peanut butter cheesecake recipe (it looks delish! ), but i only have 6-inch and 7-inch pans. How do i scale down the ingredients? I would recommend making the whole recipe and making mini cheesecakes along side as it uses ‘whole packets’ of items quite a bit in the recipe. I did as you adviced and it’s a success! Only it soften very fast outside the fridge due to the hot weather. But nevertheless, it’s a very flavourful cheesecake! Thank u so much. Hi was just wondering how you get the cheesecake out of the tin? The sides are all fine but I can never get the base out ? I use a thin metal spatula/cake slice, slide it round, and lift it off! If its that sloppy then you over did it – you can whip the cream separately next time if you wish and fold the two together and it’ll be fine. Thanku for getting back to me…I will try again as advised…it was super yummy so would be lovely for it to keep the shape…Iv tried many of your recipes…they have all been fab ?? What is double cream? Is it just heavy cream whipped? It’s the fattiest liquid cream we have, so I believe heavy cream is your alternative. I add it in liquid, and whip it all together. You can whip it before if you wish and then fold it together. Have just made this cheesecake – it looks amazing but I think we are going to struggle to eat it all within the time frame. Can it be sliced and frozen until we need it? You need to set it normally in the fridge over night, and then use it can be frozen very well. I don’t personally no – if you use a springform tin and it sets it should come out like a dream by itself – but you can line it if you wish! Perfect! Thank you so much – I can’t wait to give it a try. i am thinking of making this and was just wondering about one thing. once the cake has been decorated completely and back into the fridge, can i serve it immediately from the fridge or is it better to leave out in room temperature for a bit? This looks amazing! I love peanut butter.